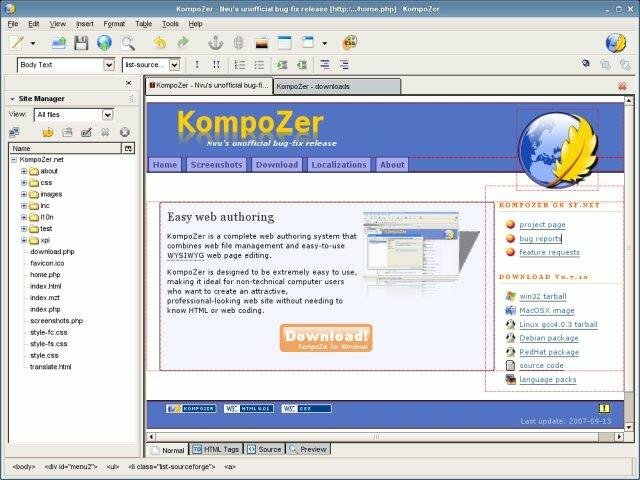 KompoZer is a free cross-platform WYSIWYG (which stands for What-You-See-Is-What-You-Get) HTML editor. This is my top recommendation for newbies. This editor is especially for non-technical computer users who want to create an attractive web site without needing to know HTML. It includes excellent features such as integrated file management, tabbed editing, and support for forms, tables, and templates, etc. The KompoZer website also directly compares the program, to the popular Adobe Dreamweaver software, saying clients will feel “Comfortable with KompoZer” with some of the features. WYSIWYG editing of pages, making web creation easy for non-technical users. Integrated file management via FTP. Simply log in to your web site and navigate through your files, editing web pages on the fly, directly from your site. Reliable HTML code creation that will work with all popular browsers. Switch between WYSIWYG Editing Mode and HTML using tabs. Tabbed editing allows working on multiple pages. Good support for forms, tables, and templates. The easiest-to-use, most powerful Web Authoring System for Desktop Linux, Microsoft Windows and Apple Macintosh users. The website will list more features, such as FTP Site management, CSS Editor, Customizable toolbars, etc. Note that KompoZer lacks support for features like HTML5 or CSS3. As they were introduced after the last version of the HTML editor was released. KompoZer is based on the popular Nvu editor – it is called an “unofficial bug-fix release”. KompoZer was brought about by certain individuals who really like Nvu but were tired of slow release schedules and poor support. Hence they took it over and released a less buggy version of the software. Unexpectedly, there hasn’t been a new release of KompoZer since 2010. If you’re looking for free, and solid HTML editor and don’t care (yet) about HMTL5 or CSS3 support then for sure you can go for it.